Here are poems wrought from three languages—intimations from the heart’s “twin caves,” honest and without illusion as the words speak true of sadness and elation through the hum and drum of living. Marra PL. Lanot’s poetry combines lighthearted wit, compassion, and wisdom. This is what poets with a genuine respect for words and worlds do. 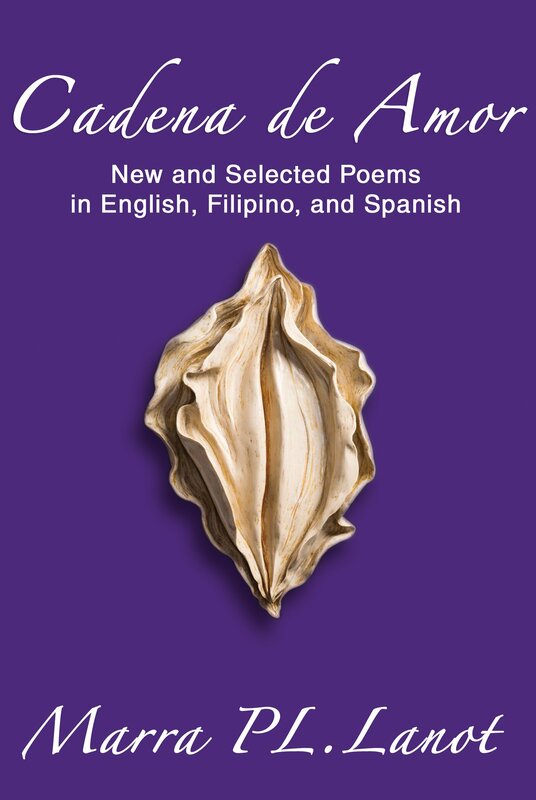 Writing in three different languages—English, Tagalog, and Spanish—she tackles even the littlest of things like when she celebrates “Buko Pie,” her cat, or declares in her own unique way that she is a woman not of one country but of the world. In poignant images, she narrates how life can be under martial law in “Batas Militar.” There are no absolute answers, but Cadena de Amor, her latest poetry collection, weaves memories of her lives and loves and speaks to our hearts, minds, and spirit. Read, reflect, and be delighted. I’ve always been a fan of Marra and this book will show you why. It is a rare delight to experience to be touched by words in three languages. Maraming salamat, Marra. Isa si Marra PL. Lanot na naghawan ng landas para sa marami pang babae na tulad ko na naghangad sumunod sa kanyang mga yapak. Sa koleksiyon na ito na nasa tatlong wika, makata siyang nakikisangkot sa mga usapang pagpaslang at kapayapaan, habang nangungusap bilang babae, habang may komentaryo sa bagong panahon ng Facebook at social media, habang nagmamasid sa paligid, habang nagmamahal. Sa panulat ni Marra, ang karaniwan nang talinghaga ng bulaklak ay talinghagang hindi naka-freeze frame (habambuhay na maganda at may bango, tulad ng paggamit ng mga lalaking makata kapag nagpapahayag ng pagsinta). Sa halip, ito’y buhay at dinamikong imahen, at sa wakas, angkin ng minsan ay pinag-alayan ng talinghagang ito. Marra PL. Lanot is a poet, essayist, and freelance journalist. She also writes video scripts and teleplays. She was short of only one cognate subject and a thesis in Spanish, major in Translation, when she quit her masteral studies at the University of the Philippines Department of European Languages. She also taught film and creative writing in Filipino and English at UP, her alma mater. She has won several prizes for her poetry and prose. She has been anthologized here and abroad as well as translated in several foreign languages. She was Associate Director for Visual, Literary and Media Arts, and concurrently Director of the Coordinating Center for Literature of the Cultural Center of the Philippines. She also served as literary editor of Mirror Weekly and Philippines Graphic magazines. Lanot has authored poetry books, Sheaves of Things Burning, Flowers of the Sun, Passion & Compassion, Witch’s Dance, and Riding the Full Moon; collections of profiles, Dream Sketches, The Trouble with Nick & Other Profiles, and 10 + 1: Mga Kuwento ng Ordinaryong Tao; and Déjà vu & Other Essays.